Dreaming of a tiny stone cottage befit for a fairy tale? The Cotswalds and Irish countryside don’t lay claim. We found some lovely little gems right here in the States! Take a peek and tell us which one fits your vision. Delta, Pennsylvania, is the location of the historic Ox Bow House, a circa-1800 stone cottage that was once part of the Castle Finn iron forge plantation. The fieldstone home is nestled on over 30 park-like acres of lush farmland and boasts a large walk-in fireplace and original slate roof. An added bonus: Muddy Creek cuts right through the property, offering the new owner opportunities for fishing, kayaking, gemstone panning and more. Built in 1782, this cottage sits on a quiet lane in the colonial-era town of Long Valley, New Jersey. The town, founded by German immigrants and originally coined, “German Valley,” boasts fine examples of German colonial architecture (i.e. amazing old stone homes). This adorable cottage is surrounded by gardens and outbuildings and also boasts lovely wide-plank pine flooring. We head to Iowa to see the third stone cottage, a circa-1875 structure that originally served as a boys’ school. 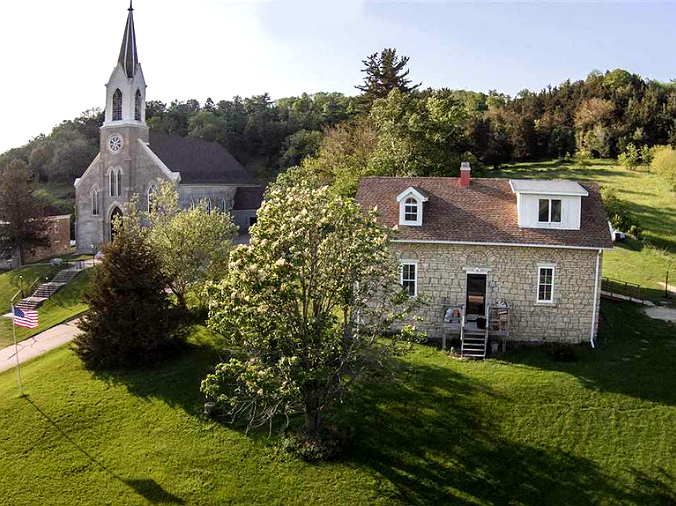 The humble stone home is located in the village of St. Donatus, a farming community founded in 1846 by Luxembourg immigrants and now listed on the National Register of Historic Places. The home is fashioned from locally sourced limestone and features white pine floors and 12-foot ceilings.